If you’re a filmmaker, vlogger, or just like to shoot some funny sketches from time to time, it’s important you have the right equipment for the job. We’ve read all the reviews and done tons of research to help you find the best tripod for DSLR video production. We’ve examined options at 4 different price points to get you the best value possible no matter what your budget is. Afterwards, we will also be discussing what features you should keep an eye out for when shopping for your DSLR video tripod, and how to determine which one is the best for you. Now before we break down each of our picks, let’s briefly talk about why having a tripod is important. A tripod is just about the most important piece of equipment you can have as a content creator. Here’s a few reasons why. Stability – The most obvious reason. Tripods can give your footage a professional feel you will never attain without one. While handheld shots have their place, sometimes you need your camera to be completely still. Affordability – Tripods can be really, really cheap considering the versatility they provide. Check out option number 4 if you’re really trying to save! Get a wider variety of shots – Without a tripod, you’re limited to static and handheld shots. If you get a nice one with a fluid head like our #1 suggestion, you’ll be able to pan, tilt, and rotate your camera for tons of different dynamic shots. You can shoot solo! – Without a tripod, you’ll need someone else recording all of your shots unless you’re vlogging. While you won’t be able to move it, a tripod could allow you to shoot things that might otherwise require a separate operator. Manfrotto is renowned for being the gold standard for mid-range filmmaker monopod and tripods. We did a full extensive review of their entire monopod line and were thoroughly impressed with their products. The MVH500AH includes a very sturdy tripod, an excellent fluid motion head, quick release plates, ball leveling systems, and a very sleek carrying case. This is the best tripod for DSLR video production by a long shot. We’ll explain why. The tripod can support a camera rig weighing up to 11 pounds; this is twice the load supported by most of our other recommendations on this list. If you know your camera rig is not going to be that heavy, you may want to save some money and pick one of our cheaper options, but we think that the added stability makes it worth your money either way. The tripod is only around 7 pounds, and has a minimum height of 20″, and a maximum height of 68.5″! That is the widest range we saw in any tripod we’ve reviewed, and will ensure that you’ll be covered no matter how you need to configure your camera set up. The sturdy legs are one thing, but the video fluid head is what receives the most praise and really makes this product shine. While most of the products we looked at were capable of perfect smooth motion, we would still see complaints popping up about difficulties getting smooth pans. That is not the case with this tripod. Everyone is really impressed with how fluid your pans are, and how easy it is to adjust the resistance on the head. The head is available sold separately if you already have a tripod and just need a fluid head for your video footage. If you don’t have enough money to splurge on Manfrotto’s high end option, the Ravelli AVTP Professional Video Tripod is an excellent, high quality tripod at a very reasonable price. The tripod has a minimum height of 27″ and a maximum of 54.5″. Yeah, that’s not very tall compared to most of the tripods we’ve looked at. It weighs 11 pounds. That’s pretty heavy. So why are we recommending this? Well, For the price range at about $150, this is an incredibly strong tripod. Heavy, sure, but this tripod is incredibly sturdy and can support much larger DSLR rigs if you happen to own one. The maximum supported weight is a whopping 27 POUNDS. Tripods that are this sturdy typically go for somewhere between $600-1000 dollars, so this is a very good deal. In our research we noted multiple reviewers talking about throwing this tripod around and really beating the crap out of it without any real permanent damage. The fluid drag head has both a pan and tilt axis and allows for very smooth motion. The knobs are huge and very easy to adjust, and lock down in a way that feels sturdy but not difficult to operate. It also comes with a bubble level, quick release heads, and a handy carrying bag, which you’ll need for a heavy tripod like this. 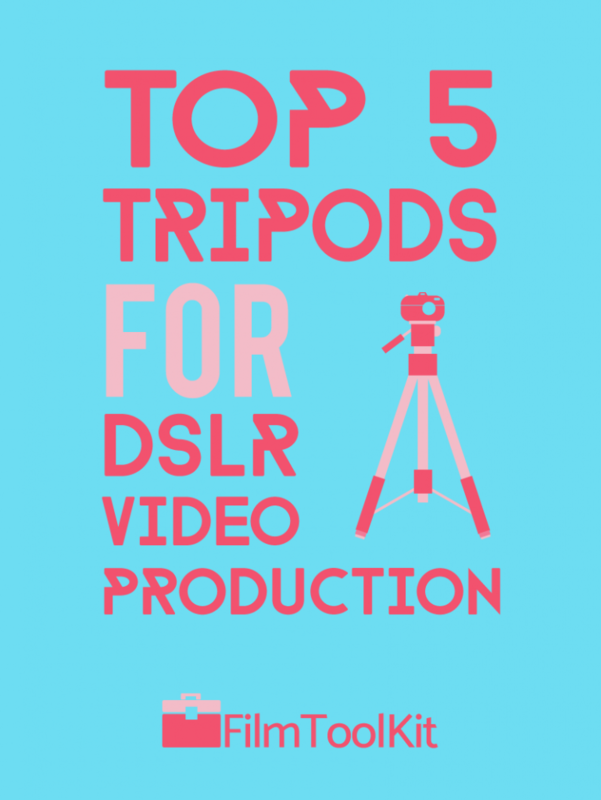 If the weight is a deal breaker for you however, check out some of the tripods we’ve recommended below. A much more lightweight contender than our previous recommendation, the Manfrotto Compact Advanced Tripod is just about as good as it gets for those of you with a budget near $100. The cost to value ratio is incredible, and you’re getting every penny’s worth with this tripod. The tripod supports around 6.6 pounds, which is more than enough for even heftier DSLRs. Completely compact at only 3 pounds, this tripod is perfect if you’re on the move a lot or shooting outdoors. Despite it’s light weight, it is surprisingly stable. 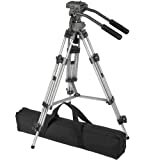 Reviewers have consistently stated that this tripod allows for very fluid pans and tilts – even if the resistance adjustment dials can be a little difficult to operate. It has a very low minimum height at only 15″, making it perfect for those looking for low angle or just short-perspective shots. It’s maximum height is a little bit on the shorter end of the spectrum, topping out at about 52″, so if you absolutely need a tripod that’s going to be taller than that, you should consider one of our other options. It lacks a bubble level, but it does come with a high quality carrying bag. Wow. A fully functioning video tripod for less than $25. With overwhelmingly positive reviews, this is one of the highest quality “budget” products we have seen in the history of this entire site. Despite it’s very low asking price, the build quality and material is extremely sturdy, and it feels like a much more expensive product than it is. The maximum load is around 6.6 lbs, although it is noted you may exceed this maximum, although it will hinder performance. The tripod is incredibly lightweight at only 3 pounds, and can be extended from 2 to 5 feet tall. Its thread is compatible with all standard DSLRs, and it even comes with a quick mounting plate to transition quickly on and off of the tripods. I’ve seen other companies sell these quick-mount plates for more than the price of this tripod alone! What I like the most about this tripod is that it has a 3 way head which allows for tilt and swivel motions; an absolutely critical feature if you’re shooting video with your DSLR. It also has two built in bubbles to make sure your tripod is on level ground. I mention these two features specifically, because I have reviewed many tripods. I’ve seen that some can cost over $100 or $200, without even including these very basic essential features. In my book, AmazonBasics has a very strong reputation for high quality products, and this tripod is one of their best products yet. Did I mention it comes with a carrying bag? The value here has us in disbelief. 360 degree panning bed with 90 degree tilt. We talked about this item in our article about picking the right stabilization for your videos. The Joby GorillaPod is without a doubt the best possible tripod if you’re a vlogger. You won’t be able to stand it up at eye level height, but in exchange, you’ll open up a whole new realm of camera possibilities. This product allows you to fully articulate the legs, meaning you can hang or stand your camera on absolutely any surface. In addition to being able to use it as a tripod, we love this product because you can also use it as a selfie-stick of sorts for your DSLR. One of the most renowned vloggers of all time, Casey Neistat uses one of these in many of his videos, and you’d be hard pressed to find better vlogs than his. Many companies manufacture products similar to this one, but Joby is by far the best brand. Their groillapods are made of medical-grade plastic and stainless steel, and many reviewers have reported that their Gorillapods are still going strong years after the purchase. It’s barely 50 bucks! If you’re a vlogger, this is a product that we think you NEED to buy. If you really need a tall tripod, you can pair this product with one of our previous recommendations so that you’ll be covered in every possible vlogging situation. This is the most important thing you need to make sure you have if you’re buying a tripod to use for video production. Unless you know for a fact that you’re only going to be doing static recordings with no motion, it’s important that you are able to tilt or pan your camera. These movements are nonexistent in the realm of photography, so photography tripods will often lack this feature. Make sure that the tripod you are buying has a fluid motion head, or at least a 3-way tilt and pan head. The latter may suffice if you aren’t planning on doing anything too crazy with your shots. Remember, if you already have, or accidentally bought a tripod that is not capable of movement, you can always buy a fluid motion head separately. Just make sure it’s compatible with your tripod. The nature of your work will dictate the ideal height and weight specifications you will need for your tripod. Some tripods are incredibly lightweight and easy to transport, but are not heavy enough to be stable in the wind when shooting outdoors. Others may be quite stable, but too heavy for your trek through the woods for your nature videos. Tripods that are taller also tend to cost a bit more money. Not everybody needs a tall one though! Finally, it’s important that you consider how durable you’re going to need your tripod to be. If you are going to be working solely out of a studio or home, it may be in your best interest to save some money with a cheaper quality aluminum model. If you are going to be rambling through the wilderness, you might prefer to splurge on a tripod with a more rigid construction so you don’t end up breaking it and wasting your money. There are a few additional features you may want to take into consideration as well. Some tripods will feature level-bubbles so you’ll know if your shot is properly aligned. Other tripods may have quick-release plates or locking mechanisms that allow you to transition between shots rapidly. Many of the tripods we suggested come with carrying cases, which is a very important feature in our opinion. Oftentimes you may find yourself carrying a great deal of equipment to your set, and things like tripods can be very unwieldy. Having a custom-sized carrying bag made just for your tripod can be very handy. Special tripods like the Joby GorillaPod have unique articulating legs that allow them to wrap around things or stabilize on uneven terrain. Think about what your shooting situations will be, and make your purchase accordingly.